The Christmas Cactus is a popular houseplant also known as Zygocactus, Schlumbergera, and Thanksgiving Cactus. They have flat, segmented stems that resemble leaves and beautiful bright flowers. 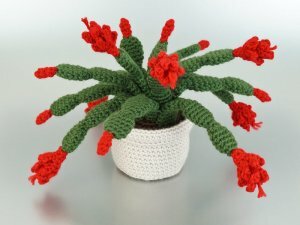 Christmas (or Thanksgiving) cacti are so named because they usually flower from November to February, but the crocheted variety can stay in bloom all year round! Christmas Cactus is an original crochet pattern by June Gilbank. This pattern includes detailed instructions and step-by-step photos so you can replicate my plant and pot exactly, or choose the number and length of stems and the number and arrangement of buds and flowers to make your own customized cactus. Yarn: worsted weight yarn in several colours (dark green; a flower colour, e.g. pink, red, white, yellow, orange, or purple; brown for the soil; and any colour you wish for the pot). Size: Pot is approx 3.5" (9cm) wide by 2.5" (6.5cm) tall. Finished plant size depends on how you arrange the stems; sample is approx. 11" (28cm) wide by 7" (18cm) tall (including pot). Date Added: 08/07/2018 by brandi e.
Date Added: 04/10/2018 by Chrisie M.
Date Added: 11/01/2017 by Sarahmarie S.